It’s an early show, decent size crowd, mostly young, a handful of parents. The first band is on stage playing. They’re energetic. I like that, goes a long way. They look like they’re having a great time on stage. Always a good thing. A song kicks in. Sounds familiar. Wait a second, it can’t be. No, please, don’t let it be so. The band is covering Eleanor Rigby, my favorite Beatles song. And I’m not a big Beatles fan. I just love that song. 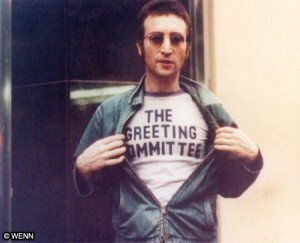 John Lennon’s bones start scraping together. Muscle starts forming, tissue, the brain begins to grow. Skin, fingers now, hair, it all starts coming together. His eyes open up, he takes his first breath in decades. Where am I? AND WHAT’S THAT SOUND???? Oh my God, please tell me it’s not so. That CAN’T BE MY ELEANOR RIGBY. He takes his newly made hand, puts it over his neck, and starts strangling himself with it. MUST DIE MUST DIE. I CANNOT BE IN A WORLD WHERE THEY WOULD LET THIS HAPPEN. As the band plays the final notes to the song. This entry was posted in Bar Story on February 7, 2015 by Clint Curtis. Paul McCartney wrote Eleanor Rigby… Lennon had nothing to do with it… Sorry!